Robotic surgery with preoperative imaging data for planning have become increasingly common for surgical treatment of patients. For surgeons using robotic surgical platforms, maintaining spatial awareness of the anatomical structures in the surgical area is key for good outcomes. 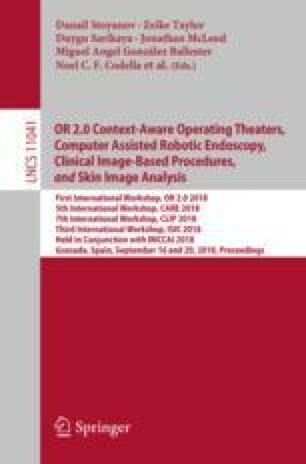 We propose a Mixed Reality system which allows surgeons to visualize and interact with aligned anatomical models extracted from preoperative imagery as well as the in vivo imagery from the stereo laparoscope. To develop this system, we have employed techniques to 3D reconstruct stereo laparoscope images, model 3D shape of the anatomical structures from preoperative MRI stack and align the two 3D surfaces. The application we have developed allows surgeons to visualize occluded and obscured organ boundaries as well as other important anatomy that is not visible through the laparoscope alone, facilitating better spatial awareness during surgery. The system was deployed in 9 robot assisted laparoscopic prostatectomy procedures as part of a feasibility study. We would like to thank Kai Hammerich, Kaitlin Cobb, Vladimir Valera Romero, Jonathan Bloom, Gustavo Pena Lagrave, Vikram Sabarwal, Samuel Gold, Graham Hale, Kareem Rayn, Stephanie Harmon, Clayton Smith, Marcin Czarniecki and Bradford J. Wood of the National Institute of Health, Bethesda, MD, USA. They have provided valuable inputs and assistance during the development and testing of our system.